Seeking Sandy: Have your cake and eat it too! You guys, I ate cake this week and some cupcakes and I didn't have to feel guilty about it! Olivia wanted to bake on Monday and I was out of eggs, then I remembered that I had pinned a recipe for lemon cupcakes with only a few ingredients that were only 1 point for a mini cupcake. Last time I was at the store, I bought the ingredients so I told her she could bake those. She decided to do it in cake form and we melted some icing for the top. Delicious! Then I got to thinking...if I could do it with lemon cake mix, why not another flavor. I like lemon, but it isn't necessarily my favorite, but when we talk strawberries, I am all over that! So I went and bought a strawberry mix and let me tell you, these are so good! You can find the lemon recipe here. If you are more partial to strawberry check out mine! I was able to make 48 cupcakes and of course ate a few! Take your pick of how to make them, but you should definitely try them! *** A few notes, when we made the lemon cake we didn't have the 100 calorie lemon yogurt so we used plain greek and the flavor was still really strong from the cake mix. So I think you can sub plain or even vanilla and they will be just as good! **When I bought the 100 calorie Yoplait Greek Strawberry, I didn't realize that it had fruit in the bottom. I didn't notice the fruit in the cupcake, although I did scoop out some of the big pieces because I am super weird about texture. 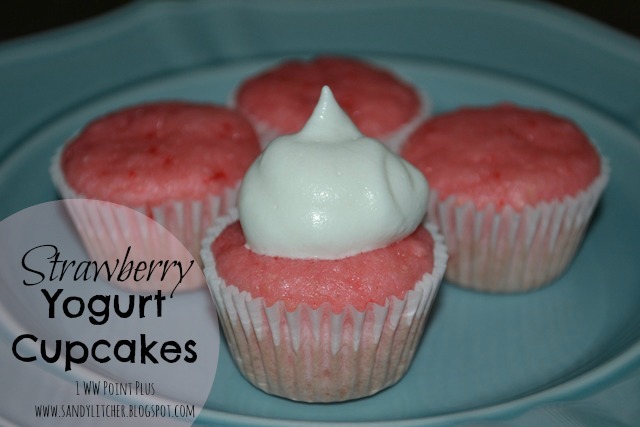 So if you don't want the possibility of finding chunks of fruit in your cupcake make sure you get a smooth yogurt! *Don't forget to add in the points of your topping. I chose frozen lite whipped topping and that is super low in points. 1 TBSP is zero points and beyond that you can have up to 5 TBSP for only 1 point. I consider that a really good choice! Remember how I said I wanted to try something strawberry yesterday? Yeah, well, Alise was helping me make our grocery list last night and she asked to make chocolate cupcakes this weekend. I just couldn't say no to chocolate!! I know I can't say no to chocolate!!! Hope you enjoyed them! Looks so good! I have been craving sweets! Gotta love a good sweet that you don't have to feel guilty about! Oh this looks tasty (: I love strawberry cupcakes! And it's also a plus that one cupcake is only 1 WW point! Can't help with sugar free, but they make dairy free yogurt. Silk brand, So delicious brand and at whole foods they have other brands. Is this just an 8 or 6 oz greek yogurt or a large container of it? It is just an individual size container! I don't remember if it is 6 or 8 oz, but I don't think it would matter! This is delicious by the way! Oh no. I wish I could say that the app is wrong, but I made this recipe a long time ago and the points were calculated differently then so there is a chance that under the new WW plan it would be more points :( I am sure this option is still lower in points than it would be with the normal ingredients but I’m not sure. Sorry!! Good luck! I am intetested in this answer as well! Does it have a yogurt taste? I very much dislike yogurt. I just made these. When I created the recipe in my app it said each regular size cupcake is 1pt. And 1 dollop of whipped cream is 1pt. I used plain Greek yogurt and a box of carrot cake...YUMMMMMM! Can’t wait to try this strawberry! If plain Greek yogurt is used, would they still be 1 pt? Weigh in Monday...on WIAW Wednesday!